We took a shortcut to Katherine Paterson’s writing through watching the Bridge to Terabithia film. It was a bit of a surprise, and at the same time it was rather as I had expected. If that makes sense? I didn’t understand any of the fantasy elements to the story. I mean, I knew they weren’t real, but initially I couldn’t work out if the children were simply playing and fantasising, or if magic occurred and moved them to somewhere else. I gather from reading up on it afterwards that it was the former. Have to admit to finding the real world happenings much more fascinating, and wish that the story had remained on that level, describing the lives of the two children and the bullying and the money problems. That part of the film was really very good, well written and well acted. So now I don’t know if I want to read Katherine’s books or not. And I’ve had the slightly uncharitable thought that Bridge to Terabithia is exactly what the judges of the Astrid Lindgren award look for. A sort of mini-Nobel. The Wikipedia entry for the film provides more information than most people will ever need, so at least it answered my question on whether the film is faithful to the book. It is. Very, apparently. The screenplay was written by Katherine’s son David, and I believe the book was based partly on experiences from his childhood. The child actors were excellent, and I was especially pleased to see a very young Bailee Madison again. But both Josh Hutcherson and AnnaSophia Robb who play Jesse and Leslie were also really good. The first third of the film we treated it as any ordinary film, but by the second third we were lost in the fantasy world that Jesse and Leslie think up. Daughter kept saying ‘there must be a point to it soon’. There was, but perhaps not one we could have guessed at. There is a death, and Daughter was in tears. It was rather sad and very touching, and I gather some people would have preferred the script to only hurt the child a little, followed by a light coma and then happiness ever after again. I’m glad they didn’t go that route. It’s sad, but it feels real. And perhaps that is why the fantasy jars too much for me. Or I’m just too old. This can run and run. Barely a week after my moan about Mariella Frostrup’s mangling of Scandinavian names, I have already had at least two facebook discussions on related topics. Anyway, that’s not what I was going to blog about. 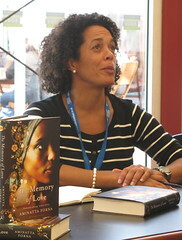 I happened upon this piece by Aminatta Forna in the Guardian. I know exactly what she means, even if my name as many of you know is somewhat simpler (=common). I even know what Aminatta looks like. Not sure how to pronounce her name, but in my thoughts I go mostly Italian. Which is probably wrong. Whenever I read anything American, be it fact or fiction, I’m always taken aback by the sheer number of ‘difficult’ names and have wondered how they cope. According to Aminatta they have a working system of asking people to spell their names out. It’s an excellent solution, and necessary, but one I avoid as much as possible. Once someone gets started on a-m-i-n-a-t-t-a my mind goes blank, and I only catch half of it and not necessarily in the right order. I can spell things out to people, but have difficulty if on the receiving end. I don’t suppose I could ask you to spell using the Swedish alphabet? Whatever. My surname causes panic in Sweden where people are quite capable of saying ‘miles’, but opt for something that would rhyme with ‘millis’ for my name. But that’s OK. They are foreign. So why can’t people in ‘British’ call centres get it right? And Swedes know for a fact that Ian rhymes with Brian. It must. Just look at it! Aminatta would like her New Year cards to bear her name, correctly spelled. We have just received yet another card to ‘Dave’. There is no such person here. Anyone less Dave-like than the Resident IT Consultant you’d have to search for millis for. Why assume that you can use pet names for people you don’t know well enough to know that it’s not what they are called? I’m so fussy that I would struggle to call a man Dave unless that’s the first version I hear. And I’m aware that my name sounds the same, whether or not you add an ‘e’ at the end. But in writing it doesn’t feel like me if the ‘e’ is present. People are always adding the unwanted ‘e’. My neighbour three doors down complains that people are always removing her ‘e’. Never happy, are we? I’m always pleased when people remember. And I’m astounded when those I barely know (or who barely know me) actually do recall the with-or-without issue. Steve Cole is one such person. Many remember the issue, but not which way it goes. If you meet someone, don’t you at least try and listen to see how they say their name? To the best of my knowledge it’s not Meg Rose-off. And Debi Gliori has a silent ‘g’. Before meeting Rick Riordan I went to his website. He has a place where you can hear him pronounce Riordan. It’s quite easy once you know it’s not said ‘the other way’. I’d be grateful (yes, I would, actually) if people could write in and correct all my own mistakes. I’ll compile a list. According to my informant, someone who shall remain anonymous, asked Ian Rankin if the reason his early books have not been translated into Swedish is because they were so bad it wasn’t worth the effort. I believe Ian’s reply was reasonably polite. Anon then suggested it didn’t matter because Swedes only want trashy crime to read on the beach. I’m afraid this secondhand information about an author event in late November is really very late. How I have nagged my informant! Finally nailed him down before dinner last night. It seems Edinburgh didn’t receive just a Christmas tree from Norway, but crime writer Gunnar Staalesen came over for a chat with his colleague Ian Rankin. It was organised jointly by the university and the Norwegian consulate. And the people with the tree. 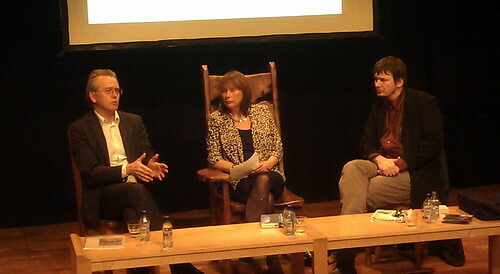 Gunnar spoke to students at the university in the morning, before a public event at the Scottish Storytelling Centre in the evening. 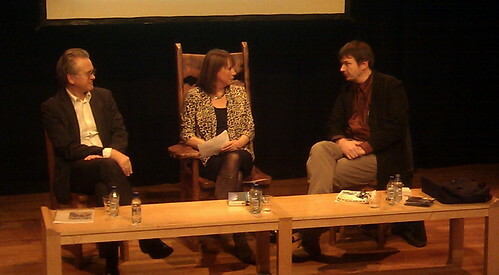 Jenny Brown moderated and I gather that Gunnar’s translator Don Bartlett was there as well. Don translates from Norwegian despite not speaking the language, and he can finish a book in just a few months. Since I can’t compete with this very excellent piece in The Scotsman, I won’t try. For facts about Gunnar and his Bergen detective Varg Veum, who is a sort of Norwegian Philip Marlowe-Lew Archer-Sam Spade type, you can pop over and read the interview. I understand that wherever Gunnar goes in Bergen he is stopped by people wanting him to commit murder in their street. Must be their Viking genes. And I do wonder if he’s hinting at doing away with his ‘Wolf’ detective, because he’s too old. Varg Veum, not Gunnar Staalesen. Ian Rankin can always murder a Nordic citizen next time, if he feels like it. Otherwise I believe a good time was had by all. If Booktrust are allowed to continue their good job, we just might end up with more young people like the two young ladies of Swedish blog Tonårsboken. I have mentioned them before, because they read so much and write so well about it, and when translations aren’t forthcoming, they read in English. For their end-of-year posts they have listed favourites from 2010. 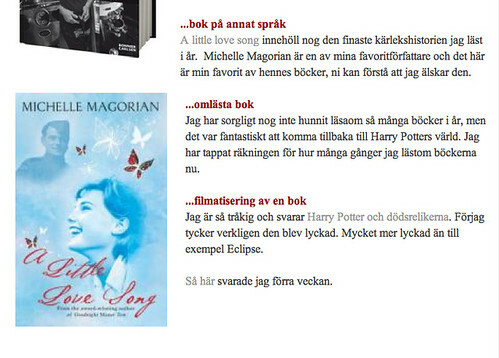 A Little Love Song by Michelle Magorian was the best foreign language book. 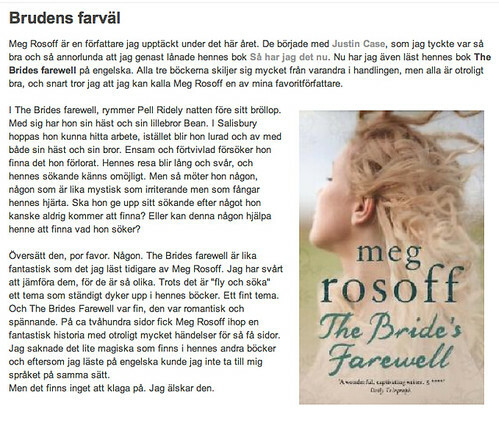 And they are very impatient over the lack of translation of The Bride’s Farewell by Meg Rosoff. It appears that if Meg keeps on like this she is in danger of becoming one of their favourite authors. which sort of made an old and wrinkly turnip witch blush a little. But compared to the Bag Lady and her newborn calf, I have nothing interesting to offer, so do go and have a peep at her seasonally confused calf. All is not necessarily what it seems. Remember that. Ogre-ness is not what it used to be before Shrek. Remember that. I finally got to Eva Ibbotson’s latest (but not last, I believe) book the week before Christmas. It’s another of her fantastic, old style children’s stories, with a continental flavour, and plenty of humour. A Hag, a Troll, a Wizard and a little boy travel to Oglefort to rescue a Princess from the Ogre. What meets them as they arrive is a little unexpected. The ogre isn’t nice, but he’s not too ogre-ish either. There are insects all over his body, which is a little yucky. He’s not too fond of baths. And the Princess Mirella is not your common garden variety of Princess. There are Norns in this story. Really old ones. Underground ghosts of the kind we have all met when they were actually alive and travelled on the underground. Aunts can be the same the world over, and greedy people are too. I have less personal experience of silly princes, but they seem like normal silly princes to me. Then there are the people who don’t want to be who they are. Many of us don’t. But you could learn a thing or two from the wishes of these people, before you yourself start wishing. Most of the story ends well, this being a traditional sort of tale. I kept wanting to brush the insects off the page. Sometimes I thought they were insects, sometimes bits of dropped food (which tells you what a sloppy reader I am), but neither moved when shoved. Poirot falling to pieces was a novelty. I’ll give them that. 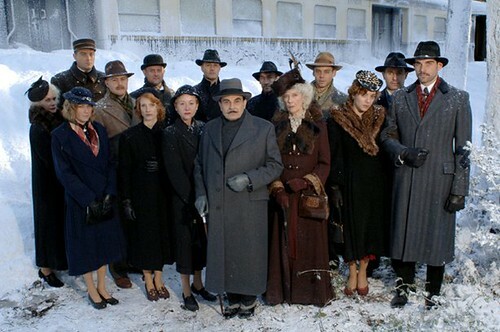 But the consensus in these parts seemed to be that we prefer a slightly saner Poirot, and if the murderers can be more cheerful as they go about their business that would not be a bad thing. At least if it’s Murder on the Orient Express, and they are almost justified, and they get to travel on that great train. But it must have been the justification that had the screenwriter in a twist. It wouldn’t be pc to allow murderers to get away with it (although it seems to be in vogue in real courts, here and now), so we need to have Poirot all religious and with flashback to a possible mistake made earlier, as well as putting the current murderers in context with the stoning of an adulteress. 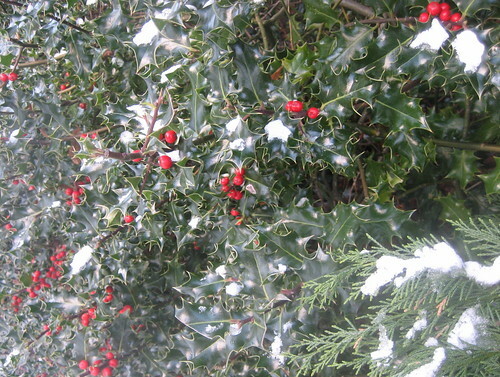 It is a very Christmassy Christie, what with the snow and all. Considerably more ‘current news’ than they could possibly have hoped for, as well. Trains stuck. Cold trains. Bad customer service. Ineffective digging in snow drifts. Almost British. The period feel is good, and the train is lovely. But we don’t want Poirot falling to pieces. He didn’t in the ‘old’ film, nor, as far as I recall, did he in the book. When did he become a catholic, or at least, so overtly religious? As the film began Daughter muttered that she hoped they weren’t going to change who did it. A bit hard with this scenario, but it began to look as if they’d change Poirot’s decision at the end. Was it just me, or had much of the casting been done by someone who knew exactly what each character should look like, as defined by the old film? And was this intended as Poirot’s last case? If so, I suppose he’s allowed to go round the bend somewhat. As Son pointed out, everyone was so very angry. We have nearly thawed the Grandmother. She arrived three days ago – almost as deep frozen as Debi Gliori’s Strega-Nonna – courtesy of TransPennine. She has to put up with a lot when visiting Bookwitch Towers, one of which was an evening of Boggling. We were thwarted in our plans for a Christmas Eve service in the Bookwitch church in Liverpool by more freezing, this time of water pipes. The plans dried up in the wake of flooding. (Couldn’t resist. Sorry.) Needing to replace our intended outing with something else, we went to the Plaza for elevenses. My past incompatibility with the Plaza should have told me not to try. We repaired instead to good old M&S, where we commandeered three tables and bathtub sized coffees. At least it was warm. After a last minute purchase of apples, Daughter and I managed to mislay WH Smith. We found it behind the Merry-go-round, and Daughter had a look at their teen books section, finding very little that wasn’t black with a dash of red. Back at BWT we found, as had been expected, that the parcel that was 24 hours late had managed to deliver itself to the neighbours. It would never have arrived had we stayed in for it. Son has a way of writing pleading missives to delivery men and taping them to the front door, wishing them a Merry Christmas. That’s the missives. We have as yet to tape delivery men to our door, but I suppose it could be done, if only as a warning. I didn’t feel nearly frozen enough, so went for a brief walk, encountering our poor postman on his very late round. Felt so bad that we offered him tea and a mincepie when he finally made it to our house. And this morning I have the meaning of the word ‘stocking fillers’ on my mind. Are they clementines and packets of raisins, or are they iPods and similar? Some weird kind of inflation would seem to have occurred in the nether regions of dress. Surely stocking fillers are tiny items of smaller value than the ‘real’ presents? Hard to manage in our case, but even so. While you ponder your reply to this, I’m off to bounce some cranberries. According to my newspaper, it’s how you test their freshness.